The following chart of the S&P 500 spanning nearly two decades shows how major market peaks and bear markets have been associated with rising levels of financial stress. Currently, we are still in the “green zone” but have trended higher after putting in a major low heading into last year. If financial stress pushes higher and trades into positive territory, this raises the possibility of a major drawdown in the stock market. Looking back at the 2000 tech bubble, financial stress warned of trouble two years before the market finally peaked. 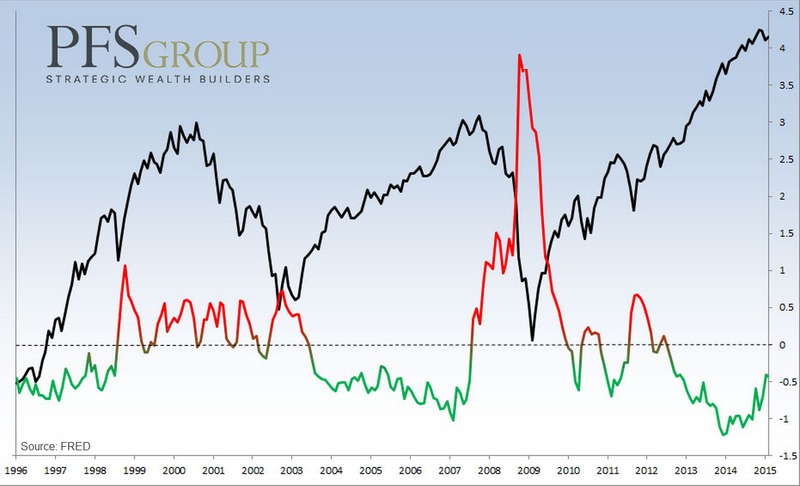 In 2007, financial stress moved into the red zone a few months before the S&P 500 peaked. An important point to keep in mind: financial stress moved into the red zone in 2010 and late-2011 but did not lead to a major reversal in the current bull market. For this reason, it is advisable to look for confirmation in various other indicators before trying to “time the top”. Readers may wish to see my post from last week showing a number of other technical signs to monitor (see here).